Haag-Streit UK (HS-UK), the leading manufacturer and distributor of gold-standard optometry and ophthalmic equipment, is pleased to announce the launch of the Haag-Streit MASK-it disposable eye patches for visual field testing. Haag-Streit has always provided innovative solutions to problematic aspects of visual field testing. Single-use MASK-it patches are a fantastic way to avoid the use of harsh adhesives and time-consuming cleaning and disinfection of reusable patches. A first-to-market, MASK-it is the only disposable eye patch available for perimetric testing. Size adjustable, the patch provides fast and effective occlusion and eliminates the time-consuming cleaning of conventional reusable patches. Available in boxes of 500, the user can simply take one from the dispenser, fold it and place it onto the patient’s eye or spectacles. Developed for single use, the hygienic MASK-it eye patch reliably eliminates the risk of cross-infection. The translucent patch is very light, allowing the patient to keep both eyes open and feel comfortable during testing. As a result, patients enjoy completely natural vision during perimetric testing and can blink whenever needed. 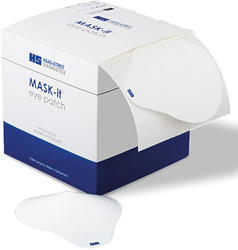 For more information on MASK-it eye patches, please call Haag-Streit UK on (01279) 883807, or email info(at)haag-streit-uk.com.